Currently, water on Mars' surface and atmosphere exists in two states: gas and solid. 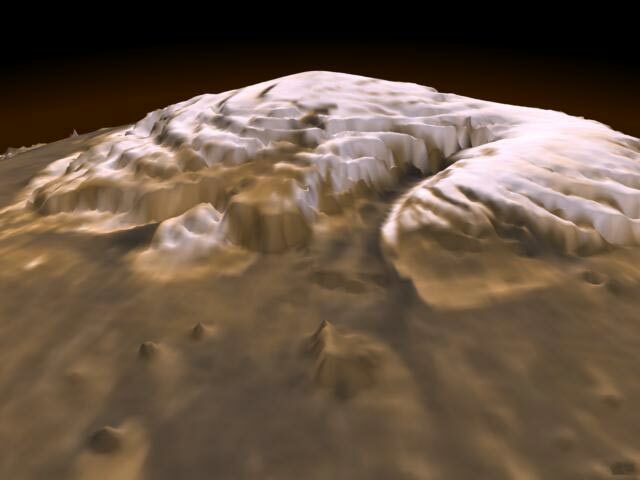 At the poles, the interaction between the solid water ice at and just below the surface and the gaseous water vapor in the atmosphere is believed to be critical to the weather and climate of Mars. Phoenix will be the first mission to collect meteorological data in the Martian arctic needed by scientists to accurately model Mars' past climate and predict future weather processes. Liquid water does not currently exist on the surface of Mars, but evidence from Mars Global Surveyor, Odyssey and Exploration Rover missions suggest that water once flowed in canyons and persisted in shallow lakes billions of years ago. However, Phoenix will probe the history of liquid water that may have existed in the arctic as recently as 100,000 years ago. Scientists will better understand the history of the Martian arctic after analyzing the chemistry and mineralogy of the soil and ice using robust instruments. Recent discoveries have shown that life can exist in the most extreme conditions. Indeed, it is possible that bacterial spores can lie dormant in bitterly cold, dry, and airless conditions for millions of years and become activated once conditions become favorable. Such dormant microbial colonies may exist in the Martian arctic, where due to the periodic wobbling of the planet, liquid water may exist for brief periods about every 100,000 years making the soil environment habitable. Phoenix will assess the habitability of the Martian northern environment by using sophisticated chemical experiments to assess the soil's composition of life-giving elements such as carbon, nitrogen, phosphorus, and hydrogen. Identified by chemical analysis, Phoenix will also look at reduction-oxidation (redox) molecular pairs that may determine whether the potential chemical energy of the soil can sustain life, as well as other soil properties critical to determine habitability such as pH and saltiness. Despite having the proper ingredients to sustain life, the Martian soil may also contain hazards that prevent biological growth, such as powerful oxidants that break apart organic molecules. Powerful oxidants that can break apart organic molecules are expected in dry environments bathed in UV light, such as the surface of Mars. But a few inches below the surface, the soil could protect organisms from the harmful solar radiation. Phoenix will dig deep enough into the soil to analyze the soil environment potentially protected from UV looking for organic signatures and potential habitability.